Why bother with the hassle of installing Christmas lights around your home, or trying to decorate the office with holiday lighting, when Plantscape can supply high quality products, install them, then take them down in January and even store them for you in our warehouse? If you live in Austin, TX, the choice is easy! Tired of climbing ladders? Want to outdo your neighbors? Simply don’t have the time to decorate? We’d be happy to take care of stringing those lights up for you! Whether you’d like to decorate for home, office, or retail, Plantscape Solutions is here to help. Beautiful and sturdy, Efficient and low maintenance. 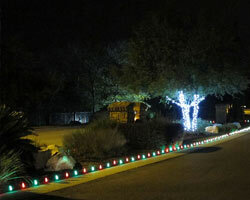 LED lights are the perfect choice for your holiday lighting needs. It’s time to move on from those incandescent bulbs. 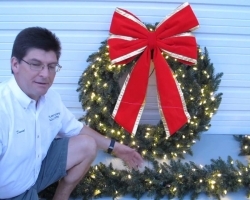 We offer hanging Christmas Light installation products from quality companies like Vickerman who got their start in 1940 and are one of the oldest outdoor Christmas lighting companies in the United States. 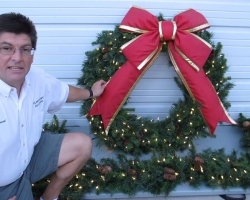 We also offer HBL premium brand garland and wreaths that come with a three season warranty. 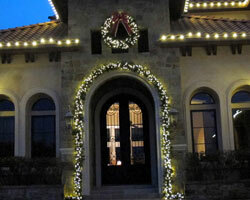 We focus mostly on the tradition C9 LED classic look and use wreaths, garland, and teardrop garland when homes have the architectural features that are well suited for this material. Why have extension cords running all over your house, breakers tripping, and large power bills when low energy use LED lights can prevent this from happening. 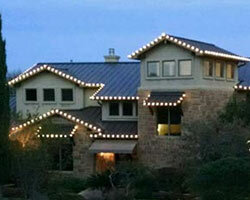 Our Austin Christmas Light Installation service is ideal for the busy family or festive business. 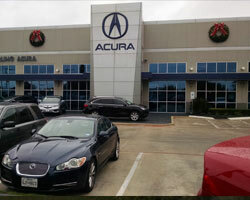 We only use dependable LED products that use 90% less energy. The C9 LED Minleon lights are the most popular size lights for use on homes and use only use .65 watts per bulb. It would take 95 of them to equal the power used by only one traditional 60 watts incandescent bulb. The smaller C7 Minleon LED bulbs use only .37 watts and it would take 162 of them to equal the demands of one traditional 60 watt bulb. The C9 lights have three diodes and produce about 50% more light then the two diode C7 lights. For homes large and small we recommend using the larger C9 bulbs. The C7 bulbs are 1.5” tall while the C9’s are 2” tall and 1/4” wider then a C7. 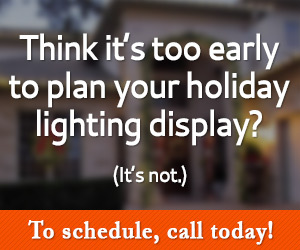 In 2014 Plantscape Solutions was the local holiday lighting company selected to be featured in Hot on Austin. 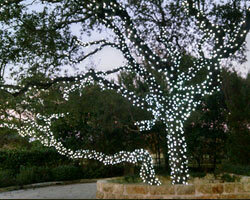 Check out the Hot On Austin holiday lighting article featuring Plantscape Solutions owner David Prew. Because the power draw is so low over 3000 C7 LED bulbs can be run on your average 10 Amp outlet. With C9 LED bulbs just over 1800 lights could be run on one 10 amp outlet. Because of the low amperage draw we are able to use small discrete 18 gauge wire to make custom extension cords to fit homes perfectly. We do not need to use large heavy duty extension cords that are expensive and don’t look very good running all over a home. 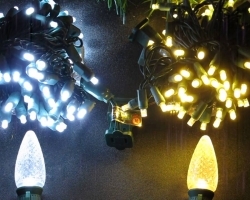 The mini lights used to wrap trees and other objects are LED 5mm conical lights. A 70 light strand of our mini lights uses only 4.8 watts of power. 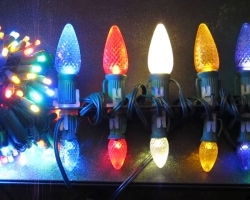 With the old incandescent mini lights only a few sets could be hooked together but with the LED mini lights up to 45 sets can be hooked together. Together 45 sets would be over a 1/4 mile long and still use only about 200 watts of power. You could power 250 sets of LED 5mm mini lights using just one 10 amp outlet. Nails or staple guns are never used to attach lights to any wood surfaces of a home. A wide range of non-invasive plastic clips and magnetic clips are used to harmlessly attach lights to gutters, shingles, metal roofs, and other areas. Plantscape Solutions has lots of experience lighting homes with metal and tile roofs using special tile clips and even magnetic clips for ferrous surfaces. Depending on the application we may use small discrete masonry inserts or plastic inserts on wooden surfaces to hang wreaths or garland that must be safely secured. Before any inserts are installed into any surface Plantscape Solutions will explain exactly what will be done in advance. We respect your home and will always treat it with the same care and consideration we would use on our own home. Please check out the videos below to learn more about our installation process and the types of wreaths and garland we sell. 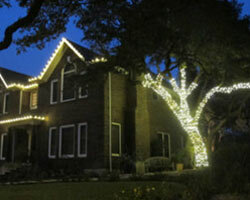 Call David at 512-626-8400 to get your holiday lighting estimate.